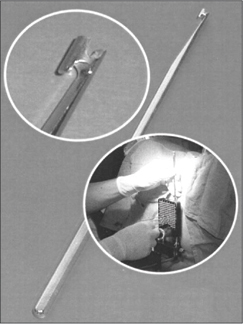 The Mick type needles obturator is provided with a sharp trocar point while the echogenic canula tip is groundbeveled to facilitate the penetration of the skin. The Mick type needle’s hub canula is "honed" for smooth transfer of seeds from the applicator into and through the needle. Above products are for single use only. Improved Seed Distribution by Means of Prostate Gland Immobilization. 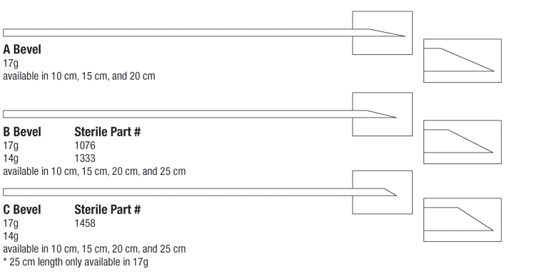 The Stabilizing Needle (patented) is designed to prevent prostate movement during the insertion of prostate seeding needles. 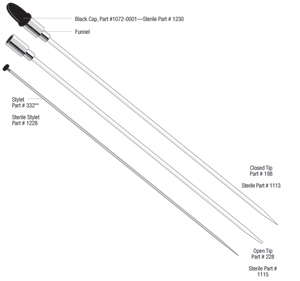 Immobilization is accomplished by deployment of a "side barb" in the prostate tissue and then securing a "lock spring" against the proximal side of the template. 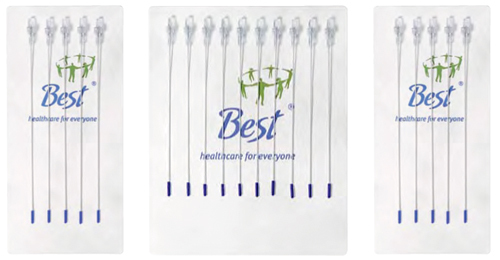 Two stabilizing needles must be used to adequately stabilize the prostate gland. 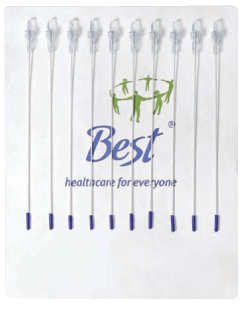 These are curved Stainless Steel Implant Needles with handles. The outer diameter (O.D.) is 0.082" and the inner diameter (I.D.) is 0.066". Two sizes are available: short and long. 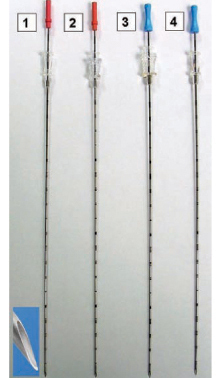 The short needle has a length of 3.5" and the long needles measures 7.25". Each handle is 4" long. 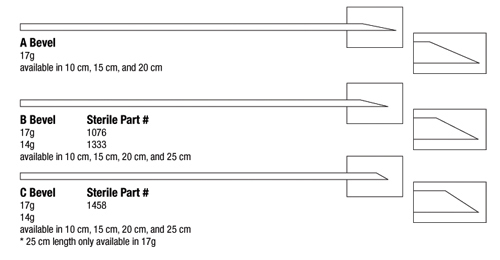 This 20 cm needle is specifically designed for use with Syed/Neblett templates or disposable templates. A funnel fixed to one end makes the ribbon loading easy and less time consuming. A special cap fits over the funnel to keep the ribbon in position. Caps are for one-time use only. This product should be carefully inspected by your staff prior to clinical use and should be used by authorized personnel only. Other implanters are available on request. Use the DIDDLER, Not Your Fingers! The DIDDLER is a device to adjust the position of transperineal prostate seeding needles during the time of seed implantation. Often, fingers are needed to reach behind the transperineal template to readjust the needle position. The DIDDLER replaces the need to use fingers which, in most cases, are too big to reach a needle between the template and perineum. The DIDDLER, similar in construction to a crochet needle, is made entirely of stainless steel and consists of a long hexagonally shaped handle with a slender tip. The tip thus allows a needle to be pushed, pulled or twisted left and right even if there is a needle right next to it. Adjust the needle up, down and sideways without using your fingers! The DIDDLER is especially effective when needle repositioning with "HOT" Pre-loaded Prostate Seeding Needles is required. Notably, the DIDDLER is most useful in the Mick technique when numerous needles are implanted either peripherally, in rows, or all at once. The DIDDLER is approximately 8" (20cm) long and made entirely of stainless steel. A high-polish finish provides for easy cleaning and flash sterilization. The DIDDLER can be AUTOCLAVED! 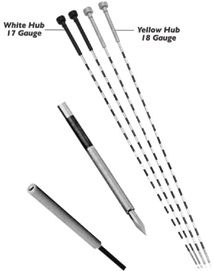 Flexi-Needles are sharp or blunt, with closed-ended needle guides, and have nominal 0.3 cm long tip. They are made of biologically compatible material. Custom lengths are available upon request. 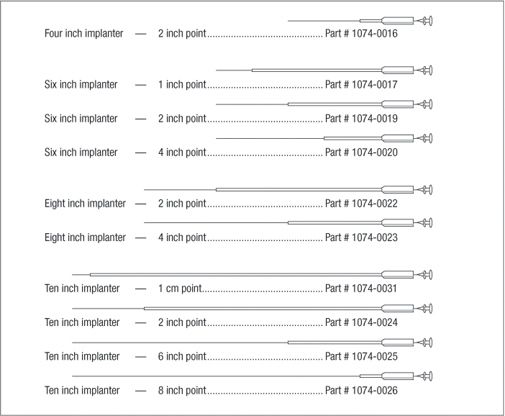 Flexi-Needles are inserted transcutaneously, using special obturators. They are designed to be afterloaded with Iridium-192 or Iodine-125 ribbon sources. Two types of caps are available (Luer Cap or Slip Cap) to place over the loaded Flexi-Needle to hold the ribbons in place during irradiation. Simulator sources can be used for localization; obturators are left in place until the time each is afterloaded with the appropriate radioactive source. WARNING : Obturators are made of Tungsten or stainless steel. Both obturator and Flexi-Needle may break if bone, hard skin, hard surfaces, or excessive forces are encountered. Device is shipped Non-Sterile or Sterile. Flexi-Needles and Obturators are for single use only. Ensure Obturator is all the way to the tip of the Flexi-Needle prior to insertion. Luer hubs may separate from the Flexi-Needle and Obturators if excessive force is applied. 13 Gauge 251** 0.095" 0.078"
14 Gauge 252** 0.083" 0.062"
15 Gauge 253** 0.078" 0.057"
15.5 Gauge 491** 0.072" 0.054"
16 Gauge 254** 0.066" 0.050"
17 Gauge 255** 0.058" 0.040"
18 Gauge 256** 0.050" 0.031"
13 Gauge 263*** 0.095" 0.078"
14 Gauge 264** 0.083" 0.062"
15 Gauge 265*** 0.078" 0.057"
15.5 Gauge 554** 0.072" 0.054"
16 Gauge 266** 0.066" 0.050"
17 Gauge 267** 0.058" 0.040"
18 Gauge 268** 0.050" 0.031"
14 Gauge 282** 0.083" 0.062"
15 Gauge 283** 0.078" 0.057"
15.5 Gauge 555** 0.072" 0.054"
16 Gauge 284** 0.066" 0.050"
17 Gauge 285** 0.058" 0.040"
18 Gauge 286** 0.050" 0.031"
13 Gauge 281** 0.095" 0.078"
14 Gauge 755** 0.083" 0.062"
15 Gauge 733** 0.078" 0.057"
15.5 Gauge 1568** 0.072" 0.054"
16 Gauge 749** 0.066" 0.050"
17 Gauge 741** 0.058" 0.040"
18 Gauge 763** 0.050" 0.031"
14 Gauge 355** 0.083" 0.062"
15 Gauge 356* 0.078" 0.057"
15.5 Gauge 1136** 0.072" 0.054"
16 Gauge 357** 0.066" 0.050"
17 Gauge 358** 0.058" 0.040"
18 Gauge 359** 0.050" 0.031"
13 Gauge 354*** 0.095" 0.078"
14 Gauge 757** 0.083" 0.062"
15 Gauge 735** 0.078" 0.057"
15.5 Gauge 971** 0.072" 0.054"
16 Gauge 751** 0.066" 0.050"
17 Gauge 743** 0.058" 0.040"
18 Gauge 765** 0.050" 0.031"
14 Gauge 403** 0.083" 0.062"
15 Gauge 404** 0.078" 0.057"
16 Gauge 405** 0.066" 0.050"
17 Gauge 406*** 0.058" 0.040"
18 Gauge 407** 0.050" 0.031"
13 Gauge 402** 0.095" 0.078"
14 Gauge 759** 0.083" 0.062"
15 Gauge 737** 0.078" 0.057"
16 Gauge 753** 0.066" 0.050"
17 Gauge 745** 0.058" 0.040"
18 Gauge 767** 0.050" 0.031"
13 Gauge 257** 0.095" 0.078"
14 Gauge 258** 0.083" 0.062"
15 Gauge 259** 0.078" 0.057"
16 Gauge 260** 0.066" 0.050"
17 Gauge 261** 0.058" 0.040"
18 Gauge 262** 0.050" 0.031"
13 Gauge 269** 0.095" 0.078"
14 Gauge 270** 0.083" 0.062"
15 Gauge 271** 0.078" 0.057"
16 Gauge 272** 0.066" 0.050"
17 Gauge 273** 0.058" 0.040"
18 Gauge 274** 0.050" 0.031"
14 Gauge 276** 0.083" 0.062"
15 Gauge 277** 0.078" 0.057"
16 Gauge 278** 0.066" 0.050"
17 Gauge 279** 0.058" 0.040"
18 Gauge 280** 0.050" 0.031"
13 Gauge 275** 0.095" 0.078"
14 Gauge 756** 0.083" 0.062"
15 Gauge 734** 0.078" 0.057"
15.5 Gauge 1137** 0.072" 0.054"
16 Gauge 750** 0.066" 0.050"
17 Gauge 742** 0.058" 0.040"
18 Gauge 764** 0.050" 0.031"
14 Gauge 361** 0.083" 0.062"
15 Gauge 362** 0.078" 0.057"
16 Gauge 363** 0.066" 0.050"
17 Gauge 364** 0.058" 0.040"
18 Gauge 365** 0.050" 0.031"
13 Gauge 360** 0.095" 0.078"
14 Gauge 758** 0.083" 0.062"
15 Gauge 736** 0.078" 0.057"
17 Gauge 744*** 0.058" 0.040"
18 Gauge 766** 0.050" 0.031"
14 Gauge 409** 0.083" 0.062"
15 Gauge 410** 0.078" 0.057"
15.5 Gauge 970** 0.072" 0.054"
16 Gauge 411** 0.066" 0.050"
17 Gauge 412** 0.058" 0.040"
18 Gauge 413** 0.050" 0.031"
13 Gauge 408** 0.095" 0.078"
14 Gauge 760** 0.083" 0.062"
15 Gauge 738** 0.078" 0.057"
16 Gauge 754** 0.066" 0.050"
17 Gauge 746** 0.058" 0.040"
18 Gauge 768** 0.050" 0.031"
**please specify length of each needle when ordering. Needles are up to 25 cm long will be packed in a tray. Needles over 25 cm long will be packed in a pouch.